We have used the ancient Egyptian convention of running the polar axis from the black sun of the Pole to the silver-white star, Sirius on Earth’s horizon. On your model it is positioned exactly opposite on the underneath of the model as a five-pointed star, and is also thus marked on the outer circumference of the flat diagram below (which you may wish to print out to refer to and colour in with the same colours as on your model (see list of paints or Computer colours (RGB) to use under Cosmokrator's Colours)). In Egypt during the Gemini-Sagittarian era, when Sirius started to appear in the sky at sunrise the astronomers of the time noted that it heralded the imminent flooding of the Nile river a month later, and so this brightest star in the sky was worshipped as the Goddess Isis, and celebrated as the marker for the start of Egypt’s New Year at the Summer Solstice. Because of this ancient tradition of using Sirius as the marker for the beginning of the year (like the third, alarm-setting hand on an alarm clock) the five-pointed star on Cosmokrator also stands for this same 'alarm hand' marker - known today by astronomers as the ‘Vernal Point’ - the marker which alerts society to the start day of the next New Year. Only many centuries later did Egyptian astronomers realise that Sirius itself slips backward in the zodiac and is not as reliable a pointer for the New Year as they thought, so other markers were added to the repertoire. We have placed a Spiral in the smaller triangle within the Sirius triangle at the base of Cosmokrator to represent the phenomenon known as the Precession of the Equinoxes, or the backward slippage of the Vernal Point round the zodiac over a period of 26,000 years (termed the ‘Great Year’ by Plato). This is explained fully in one of our final books but see also on this website under Understanding World Ages). The same spiral is indicated by one turn in the outer circumference of the flat diagram of the zodiac given below. We have now explored the first polarity on Cosmokrator – Earth Heaven, shown as the Black and White opposition. We have looked at (the Polar Axis) and - (the Horizon around which the Sun and New Year marker (Vernal Point) come together during a Year). These are the two primary fixed fields in our experience of Time which, like tent pole and tent, make a framework in space for all the stars and planets that pass round inside it, which ancient Man used as a vast clock of increasing refinement. Now we are well positioned to consider the revolving Colours on Cosmokrator – which taken in this context stands for the sky, divided into the territories of the Planets and their Signs as held in place by the Polar Axis. The Zodiac wheels one circuit every day against the Horizon as the Sun rises against it every day along the Ecliptic during one whole Year (the 'Ecliptic' is the path the Sun follows through the Zodiac stars). To highlight the nature of the Signs and their Planets, they have been arranged on Cosmokrator in pairs of complementary Signs and their colours, which are equivalent on other levels to energies, or musical notes (see Book 1). If you are unfamiliar with the symbols for the Signs as given on the outer triangles and squares round the equator zone of the model - and may not know the symbols for the more unusual Planets, marked in the inner zones, check on the diagram below, where the names are written against the symbols (here, the Planets are on the outside) - and then see their corresponding colours on Cosmokrator itself (see also under Cosmokrator's colours). Our zodiac for the first time uses the full Age of Aquarius astrology, which means that we now know of 12 Planets, each of which can be assigned to the overall rulership of a Sign – on the model this means we have divided the colour spectrum into 12 semitones for the Signs, and then into 24 micro-tones for the inclusion of the Planets’ colours governing the Signs. (In Books 7-9 we fully demonstrate the accuracy of these relationships between colour, music and astrology at this level of fineness.) Having the full panoply of Planet and Sign vastly improves our ability to analyse and interpret what is going on in people’s lives - be pleased to know that you are pioneers in its use! You have seen from the first exercise that the pairs of opposites for the Zodiac and its planets are expressed as pairs of complementary colours on Cosmokrator, while their actual sequence in order of time in the sky is given on the flat diagram above. As you start to use Cosmokrator, you will learn the meanings of its facets gradually as you go along, until slowly the symbols and their colours will become familiar enough for you to know them off by heart. It is worth copying the diagram above with ruler, compass and pen and ink, to fix them more quickly in your mind until you know them as automatically as the normal alphabet. Or you may wish to print it off and colour it in using the paints or computer RGBs listed in Cosmokrator’s Structure and Colours. Learning by doing is the best way to familiarise yourself with your Cosmokrator. For details about what people are like who have their Sun in one or other of these signs, I recommend you buy, beg, borrow or steal a copy of Linda Goodman’s Sun Signs (constantly available in Pan paperback), since she is the only astrologer to have begun, before her death, to adopt all 12 ruling planets and mention their properties. For how you get on with people whose Sun Signs are not opposite to yours we leave out the detail for the time being, because our exercise for the moment is to understand opposite extremes. However, you might like a preview of the other angles between Signs of the zodiac which are significant, if you want briefly to check the colours of people you come across who are not opposites. 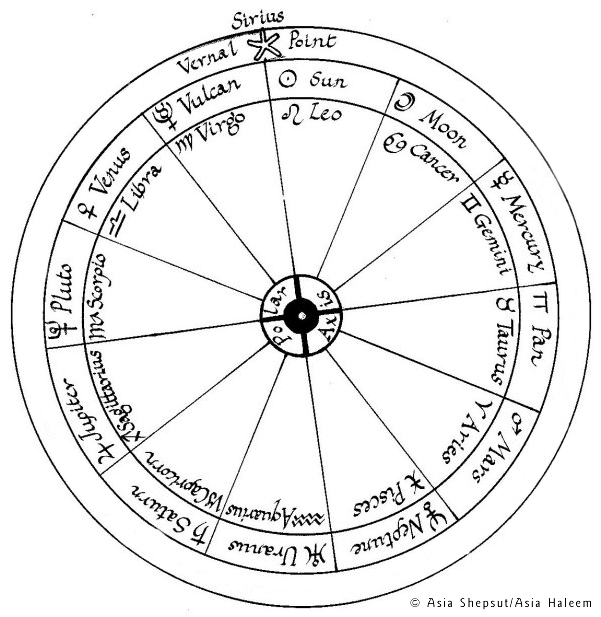 The diagrams below come from the book on World Harmony written by almost the last Astronomer to see no conflict between that discipline and Astrology - Johannes Kepler (Newton was the very last to combine the two naturally - until we come to the Aquarian astrologers of the coming new era). and if people’s Sun Signs are six signs away (at 180° apart - opposition) then they are in opposition: the tension is almost intolerable but at maximum excitement. Look also at the Element of the Sign as given under Using Cosmokrator as a Calendar. As a rule of thumb, signs of the same element, being trine, are extremely happy with each other, and Fire and Air signs, or Earth and Water signs, being sextile or in opposition to each other, also go well together. However, where signs are square to each other or next to each other the elements do not mix so easily, so there is not as much of a harmonic buzz between them. Trine and sextile relations between Planets or Signs and their Colours are therefore harmonious, while Signs at right-angles to each other are dissonant – it is usually said that relationships on the square are there to learn lessons from, so it is better to look them in the face and try to handle them, rather than run away! If you want the precise astrological detail about compatibility between Sun Signs types, you can always consult the best-selling books that analyse compatibility in depth in every possible combination, such as Linda Goodman’s Love Signs (also Pan paperbacks). Because we have so much else to tell you about Cosmokrator’s other uses in future books, whose overall purpose is to display the laws of correspondence between different octaves of existence, we do not plan to duplicate the material in the excellent astrology books that already exist. What we do ask is that you share with us your experiences of testing people around you by using Cosmokrator’s system of astrological colours, for inclusion on our Feedback corner on the Home Page. We will then build up a picture of how Aquarian Age Astrology (AAA) deepens our use of one of the few unbroken traditions inherited century over century, millennium over millennium, from the Ancient Near East!